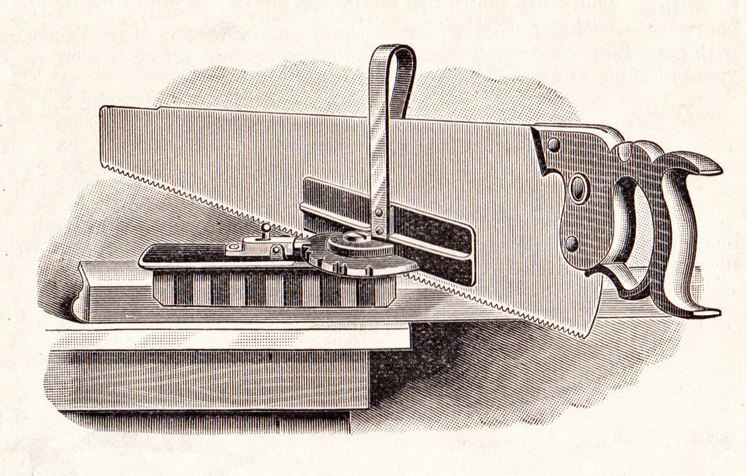 Before he invented the iconic Langdon Acme Miter Box, William Parsons, an employee of the Millers Falls tool company, created a light-weight “miter machine” (so called because it wasn’t very box-like). 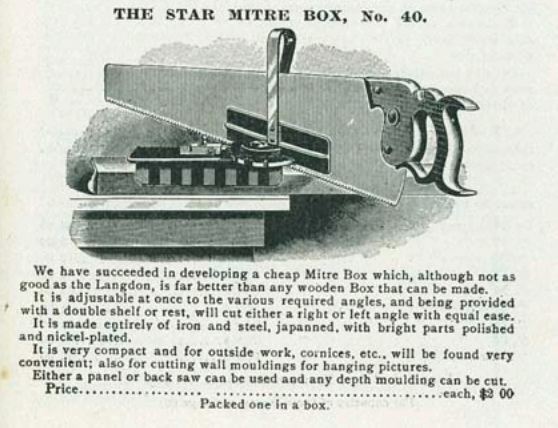 Patented in 1902, it was marketed as the Star Mitre Box. 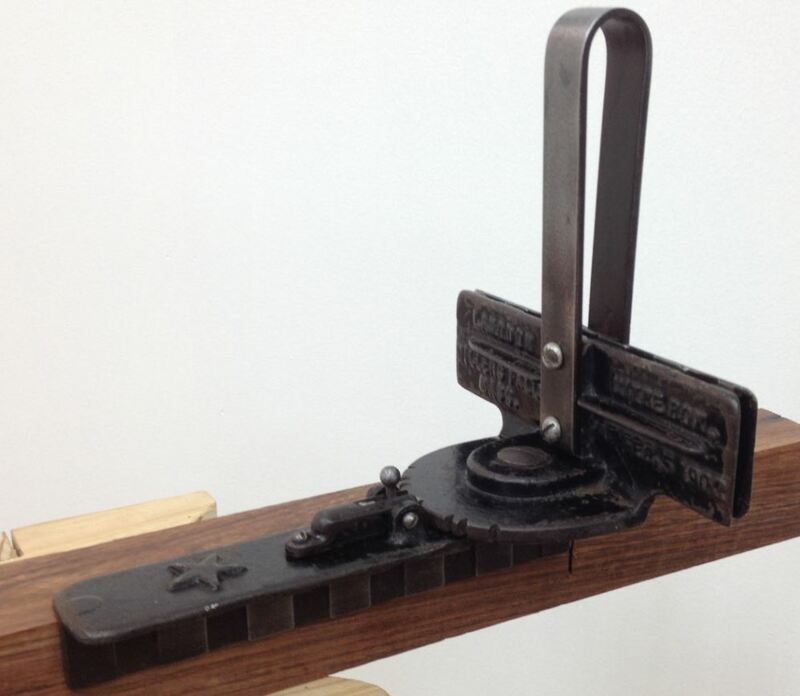 This early invention of Parsons was significantly smaller than the typical wooden and cast iron miter boxes commonly found in shops at that time. 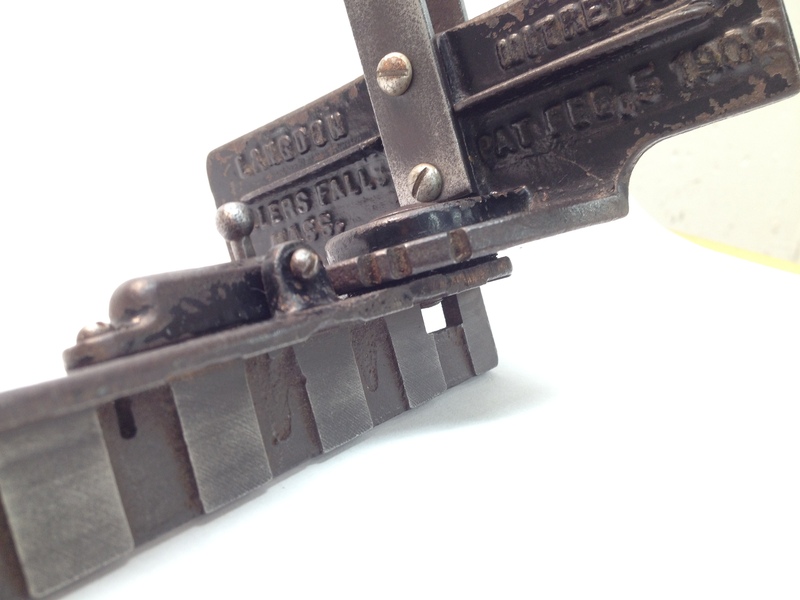 It was also more rugged, lacking the fragile legs you often find broken (and then brazed) on older miter boxes. 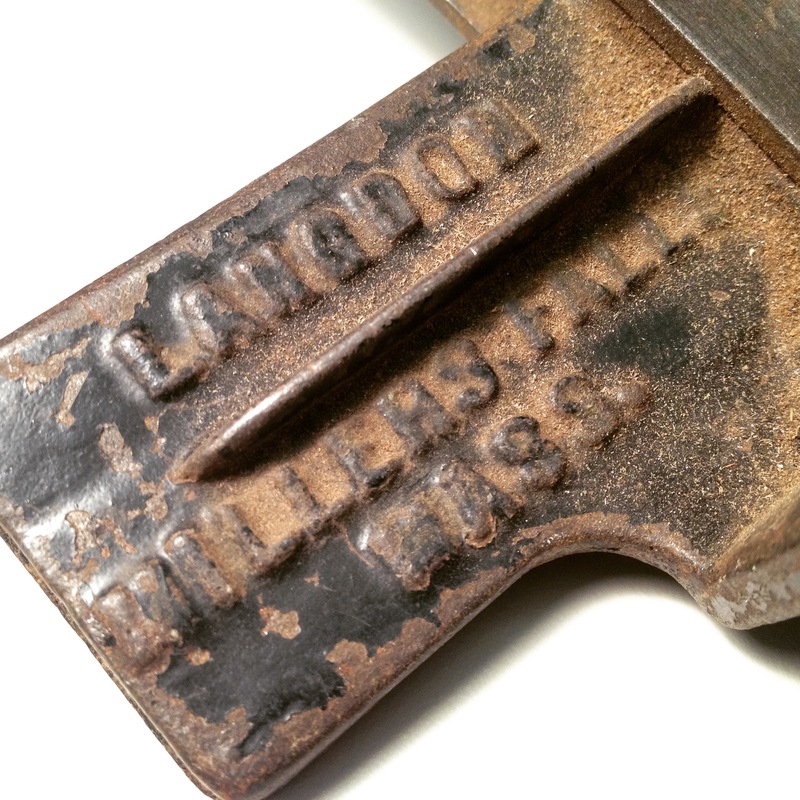 Millers Falls promoted this combination of durability and portability in their marketing, claiming you could even use it to cut cornice moulding while standing atop a ladder! In 1907, they released an upgraded version of the tool. 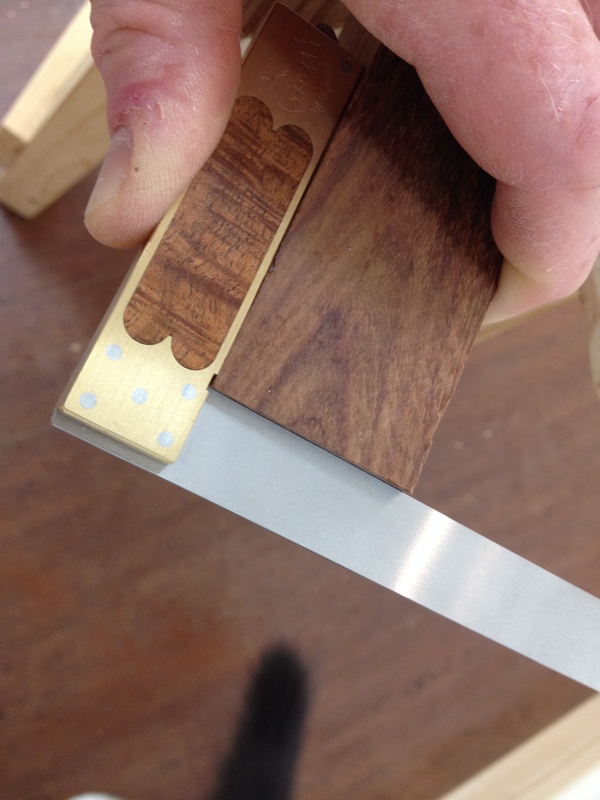 This newer version featured a tilting saw guide, giving you the ability to make compound miter cuts. 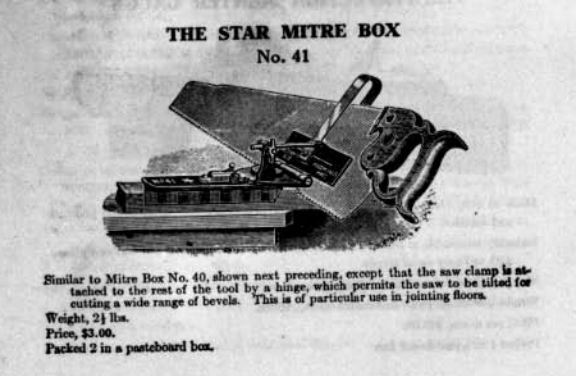 The earlier version is referred to as the Star Mitre Box No. 40 in old tool catalogs I’ve seen, while the latter version is referred to as the No. 41. I recently acquired my example of this tool while searching for who-knows-what on my favourite auction site. At first, I passed over it without a second thought, my mind on other things. But five minutes later, I had a “wait a second…’ moment as my brain finally kicked in and I’d realized what it was. Having read about it before on OldToolHeaven (which is also where I got some of the information used in this post), I knew it was the precursor to the Langdon Miter Box. I also knew I’d never seen one before, either in a collection or for sale. Frantically, I retraced my searches (not always an easy thing) and, finding it once more, took a longer look. It didn’t take another five minutes for me to decide the seller didn’t really know what they were selling (the BIN was under $30, with free shipping) or to conclude that I wanted to get it and study it more closely. Honestly, I also thought it might prove useful in my shop. I seem to do just as much work with construction-grade lumber as I do with dimensional lumber, but I hate lugging my miter box around the house and garage and I hate carrying the lumber down to the shop to use the miter box. I don’t think I’ll ever find myself cutting cornice moulding while standing atop a ladder, but I could see it earning its keep. It arrived in the post in short order and the next time I was able to get into the shop, I disassembled it and began removing 100+ years of grime and gunk. There was a fair amount of japanning loss, but it still looked to retain maybe 75%; not bad for a tool designed to see use outside the shop. In disassembling it, I quickly discovered it was adjustable! Of course it is! You can’t rely on a factory setting to remain true for the life of the tool, can you? The two screws on either side of the sliding pin that locks the fence in position can be adjusted with great precision. A notch in the fence plate allows you to set the fence to 90 degrees. Additional notches on either side of the center notch are presets for 22.5, 30, and 45 degree cuts. The guide that holds the plate is designed to work with full-sized, panel, and back saws. As long as you have a big enough saw plate that it can stay in the guide and still cut to the depth you need, it should work. I made test cuts with a full-sized D-8, a D-8 panel saw, and my Bad Axe 20’ miter saw; all performed well, though of course my Bad Axe miter saw excelled at the task. The Star Miter Box isn’t perfectly balanced that it would sit on its own, so I chanced using some double-sided tape on the back of the fence with the lighter panel saw for the stand-alone pictures. I didn’t want to risk the miter box falling with the heavier saws; even just a few feet off of a cork floor, I’d rather not drop and damage it before owning it less than a month. 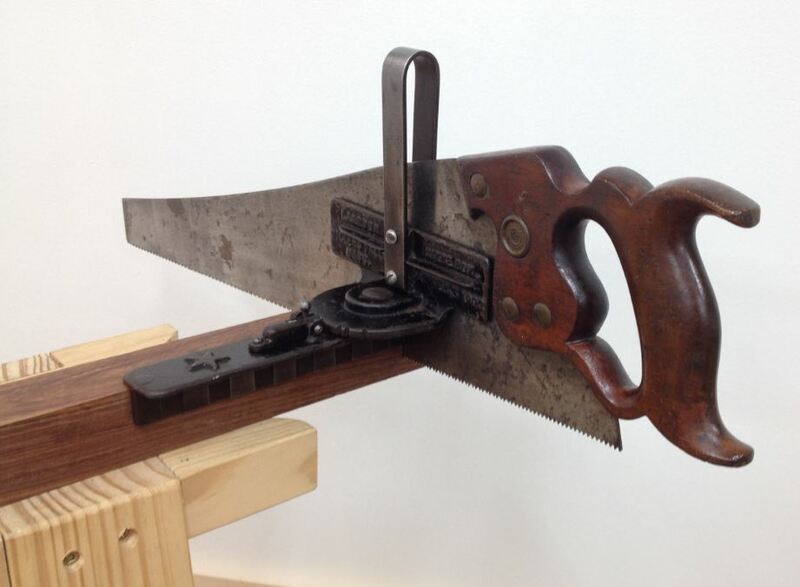 And, of course, I didn’t want to damage my saws, either! As you can see, it made a perfectly square cut with almost no effort on my part. Oh, yes, I can see this being used in my house. I spent a little time practicing my Google-fu to see who else on the interwebz had an example of one of these miter box guide thingys. Interestingly enough, I was only able to track down one other person, Mark van Roojen, who has posted anything on the internet. I sent Mark an e-mail and we exchanged some thoughts and discussion on our highly unusual items. Aside from a few forum hits, where it is Mark asking for any information about his No. 41 back in 2007, I couldn’t find anything else. So I figured I would document what I found, partially because I found it highly interesting. But I also thought maybe there are others out there who have one of these sitting in their shop and they don’t know anything about it. If you’re one of those people, now you do. If you’re not one of those people, now you have something new to keep an eye out for. Sorrynotsorry. I don’t know about that. It’s pretty cool! With your full sized D-8 what would be the max depth of cut? I am doing some timber framing now and this might be useful for tenon work. Congrats on this great find. Ummm… I didn’t measure that. But it would be whatever your saw plate height is, minus an inch or two. Awesome, Ethan! That is a neat tool. Perhaps someone should be making that again! Great idea, Joshua! I’ll check with Robin and/or Tom and see what they think! I like the new/old tool, You did great in getting the tool. Is their a value for no 41 miterbox.What would be a good price to sell it. I have absolutely no idea. Your best bet is going to be to search completed listings on eBay to see what they’ve sold for in the past. Or look for several examples of any actively for sale by tool dealers. Thank you for writing this as I just got one of these yesterday and did not know what It was. I had purchased abut 5 truckloads of various hardwoods from a gentleman who was selling his entire estate. When I pulled in yesterday to pick up a load someone helping him clean up was filling a loader bucket with stuff and emptying it into a large dumpster. I saw some hardware and other good stuff in the bucket and asked if I could pick thru it. 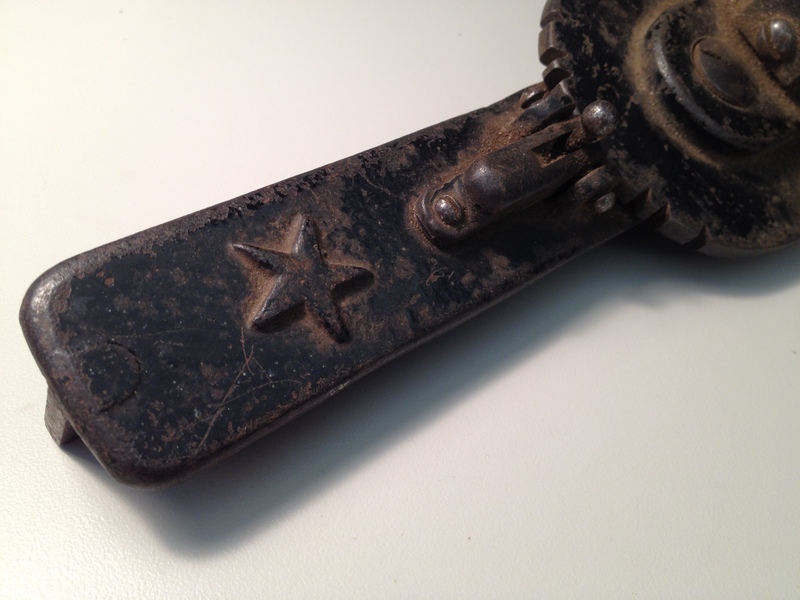 While doing that I picked up this odd looking cast iron piece . I thought it was just a piece of an old miter box and almost left it to be hauled to the dump. Luckily I decided to take it home. I Googled langdon miter company and found your site. I was thrilled to learn what it was as I have been collecting old tools for a year kmow. Mine is identical except that in the upper right where yours says Mitre Box mine says Mitre Box Co; and in the lower right instead of the patent date mine says “PAT. APPL’D FOR”. I will get you a photo of it and you are welcome to post it. 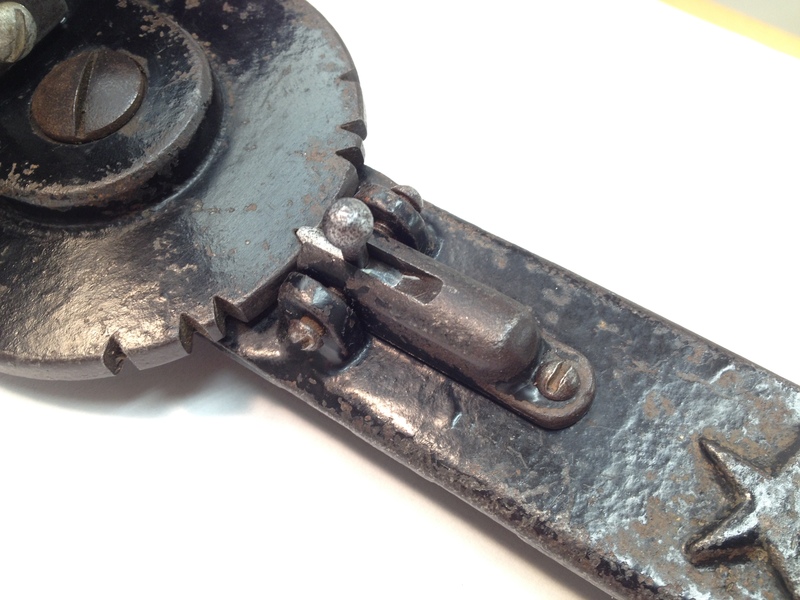 Thanks again for your site as it saved a piece of tool history. Glad you rescued that tool! Sounds like atrocities are happening there, unfortunately. Thanks for the information! It sounds like we have types now, with yours being an earlier Type One and mine being a Type Two.